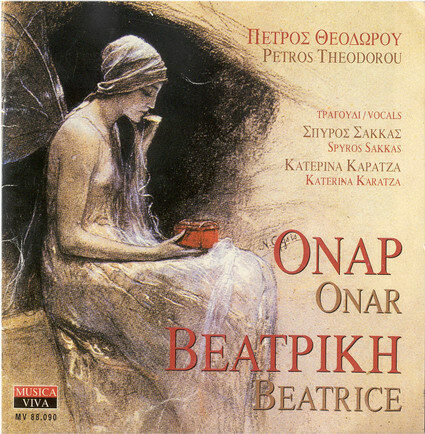 This CD includes the two Theodorou’ s LP albums, «ONAR» (1989) and «BEATRICE» (1992). From the original sound material, here, are only excluded: two instrumental pieces of «ONAR» and the prelude from «BEATRICE». Three short interludes are added to the «BEATRICE» version for this CD, which were recorded at a live concert (1993). My initial thought was that works that already exist as LP albums are scarcely in need of yet another accompanying note. But as the production of this CD proceeded, various things were going on in my head and this note gradually took shape of its own accord. It seems to me that there is a very special time for the person who has created a music . This moment is the one when when the music «jumps» forth from the mind that gives it birth and is recorded in order to appear in any form in the real world. A time fraught with hidden, conflicting emotion (like any parting that isn’t «really» a parting) A time that becomes a special sign, a nodule inextricably lodged in the musician’s total personal time. And that sign is much more than a temporal marker. It is as though the image of the musician has been captured, as though one’s whole self is crystallized just as it is at that time. You see, one’s existence is inevitably and in a mysterious way contained within one’s music and «registered» with it whenever it is heard, played or published. Even though the music for the two works of this CD wasn’t composed «now», I do not think that in their CD form they contain only fragments of myself from a past time. Whether I realize it or not, there is also in this publication my decision to create a special bond between myself and the past. Thus, in this CD, the same music of the past, manages to contain something of my present. I say «special» (bond) because the fact that these two works are being re-released in a CD is quite different from their being performed again, for instance, in a couple of concerts, or listened to again one evening. From the moment they embark upon the process of re-release, they automatically demand an active link with reality, with the present time. It is not as if you are simply remembering something of yourself. Rather it is as though you ‘re becoming something that is shaped out of THEN and NOW. What you were, plus what you are. Like laying several patterns of colorful transparencies one on top of the other to create a new pattern. So, now that «Onar» and «Beatrice» are being re-released, I ‘m becoming one, in my present time, with my images of the past. I am actually entering a game of non-linear time where Now, Then, Before, After, are without very strict limits. It is a risky a, ambiguous and fragile sensation of time. Yet, it is fulfilling my need to experience the unique continuum of moments, hours, days, years. Moreover it’s also a nice opportunity to assert that I feel «up-to-date» through the integration of my moments, my experiences and my images, not through their fragmentation.